All-in-One Reporters at Nashville Station As part of a strategy to cut costs and improve its newsroom, one Nashville TV station has converted its staff to a collection of all-in-one producers. Everyone in the newsroom, from anchor to camera man, has the power to produce, edit and broadcast their own stories -- the so-called "Video Journalism" model. In Nashville, a local television news station is experimenting with the very idea of who can be a reporter. In fact, at WKRN, there's no such thing as a reporter -- only VJs, or video journalists. Just about anyone on staff, from cameraman to editor, has been trained to grab a small digital camera and file reports. While critics call it nothing but cost-cutting, people at the station say it has fundamentally changed the way they approach the news. When the bosses at WKRN-Channel 2 News announced they'd be converting every single person in the newsroom into a video journalist, to film, edit, and write their own news stories, the staff more or less responded with dread. "There was a genuine sense of fear in this building," says Andy Cordan. "People that have been doing this for 20 years, and suddenly, like, it's no longer doing that. You used to make pizzas. Now you are going to polish rocks! Enjoy yourself." Cordan has worked in television news for nearly 20 years -- a self-described "blood and guts" crime reporter. His partner in crime reporting has always been Al Devine, his photographer. But last year, WKRN split up the team for good in the process of changing the entire station over to the VJ-format. It was a plan aimed at shedding the station's last-place ratings. That meant that Devine, a round-faced cameraman with a wide smile and penchant for brightly patterned shirts, had to learn to write and voice stories for air. "It was a nightmare, you know," Devine says. "You couldn't sleep because you were thinking, 'How do I get this story?' All of a sudden, you had to use a whole different side of your brain. I wasn't a writer. I could edit. I could do most everything else. But I wasn't a writer. I still type like a pumpkin." But since being trained as VJs, Cordan and Devine head out on their own, on separate assignments, with a handheld video camera and a laptop. They each set up their own interviews, film the event, edit the images and sound on their laptops, record their voices for the story and get it to the station control room for air. And it's every man for himself when pitching ideas at the morning news meeting. In the old days, says News Director Steve Sabato, he would arrive in the morning to assign give to six stories, culled from newspapers, press releases and items gleaned from the police scanner. Those stories would be assigned to a few two-man crews. 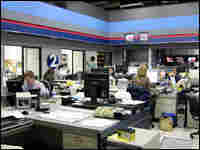 And the reporters in those crews would repeat the same handful of stories for the newscasts at 4 p.m., 4:30 p.m., 5 p.m., et cetera. That changed when everyone had the power to produce stories. "We rarely chase car wrecks anymore," Sabato says. "We don't show up for news conferences about overnight busts at convenience stores and, you know, shootings over drug crimes. There's much less of what I would call institutional and official crime stories." Instead, more stories are airing on topics such as a local immigration forum, an arts commission report and an investigative story on corrupt lobbyists, all ideas mulled over at a recent news meeting. These days, the newsroom can pursue upwards of 15 stories at a time -- a selling point WKRN advertises to its audience. Brad Ingram, a board member of the National Press Photographers Association, says, "If you go to any message board in the photography world, the two words 'VJ' is like a cussword." Ingram points out that there are great backpack reporters, or VJs, that have been working around the country for years. But converting an entire station staff to the model is rare and does not sit well with experienced cameramen like him.